Judith discovers that a madwoman named Jenny lives in the tower room. Rachel Drummond, sensing danger, goes to Barnabas for help. 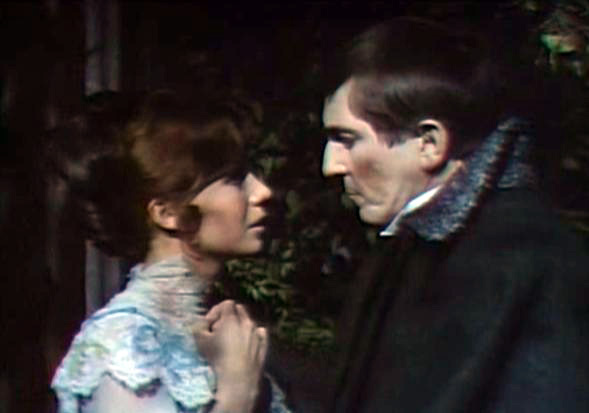 As their mutual attraction grows, he vows to investigate the strange happenings at Collinwood. Da plane, da plane, and welcome to the briar patch. Traditionally, this is the one where I am supposed to talk about Crazy Jenny and Marie Wallace’s Bold, Uninhibited Performance, because this episode really establishes the character... beautifully. Not only do we see her at her nearly-most-histrionic, but we see range in both Jenny and Wallace. Neither character nor actress is one-note, and for such an extreme character, kicking off with that means to establish the potential for suspense any time she is on screen. Indeed, Jenny is an authentic wild card, and we’re never allowed to get ahead of her. Not only that, she’s a poetic one. Her intelligence tells us scads about Quentin and his tastes, once we learn that she is his wife, and it makes her both a worthy opponent and a victim who’s fallen from the highest of mental towers. Oh, and she has a musical number, which reveals a predictably rich voice for Wallace, a stage vet who never did featured singing in musicals. It’s exactly the character debut you’d want, both quintessentially “Jenny” and teasingly unpredictable. But I don’t want to talk about that, so you’ll find no mention of it here. The secret rockstar of this episode is Barnabas and the side of him we see emerging. He even has swagger to his melancholy. For all of the high stakes and tension of Mission: 1897, he’s having the time of his life. How much of this seems real to him? 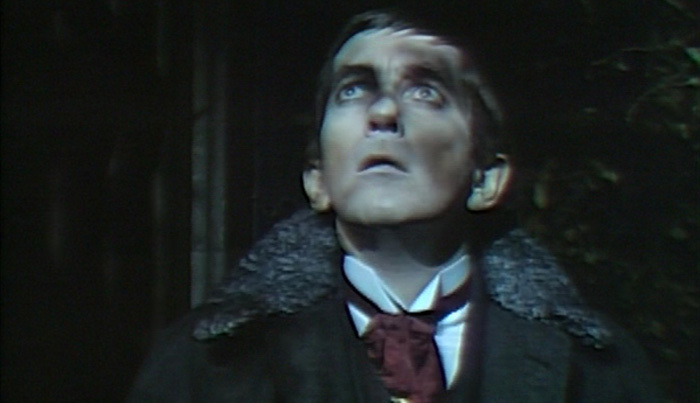 We are still in the pilot stages for a Dark Shadows that is essentially its own spinoff. In 1897, the show distills and refines itself, and then reinvents the recipe with that clarified formula. It’s not just Dark Shadows, it’s Dark Shadows that knows it’s Dark Shadows… what that means, what that allows, and does so without a lazy sense of privilege. The star, Barnabas, is getting the same rebooted treatment. Barnabas is like a successful nighclub act that’s finally getting two shows nightly at Caesars, and isn’t wasting a moment. He has almost a giddy sense of confidence that redefines the character without erasing his essence. 1897 is the perfect place to bring out his best, and he has to be wondering why the hell he had to wake up in the day-glo cereal box of post-Camelot 1967 instead of here. 1897… the Future! Just enough advances from his native time to crackle with new wiring, which probably shocked Dirk Wilkins across the drawing room more than once when he installed it. And just enough proximity to his own era to still know how to dress for dinner and pen a decent thank-you letter. Everyone is kind of a variation on what he already knows, but with a bit more transparency, and wait, here comes Maggie, I mean Josette, I mean Rachel, and by Rachel, I mean eventually Kitty, and by that, I mean Josette. Ah to hell with it. It’s Kathryn Leigh Scott and we’re darned glad to see her, too. And this character seems to be open to dating. He’s got gypsies instead of Willie, and they’re twice as wise and on a familiar level of untrustworthy. Plus, they’re superstitious, requiring him to waste less time making threats. They know the score. I was going to say that the downside is no Julia, but after a week or so without her nagging, spying, moralizing, and guilting, I’ll just say, plus, there’s no Julia. She may be a friend, but, as I said, he’s on vacation. And instead of pretending he’s on a secret mission, he really is on a secret mission. The worst that happens is that he gets stuck there. Oh, don’t throw me in the briar patch. And maybe the timeline gets changed a little bit. So what? Big deal. He was a tourist there, too. He’s got the Old House. He’s got Maggie more than he ever had her before. He’s got lackeys. And everyone enjoys a good, poetic turn of phrase rather than just staring at him like they’re going to beat him up in back of the Blue Whale and take his lunch money. But on what is basically his big date with Rachel, he is smoother than caramel cognac. And the old dog knows it. It’s like a Hammer production of James Bond. His scenes with Rachel have dialogue that’s practically musical. Cornier than Kansas on the 4th of July. And they work. Every syllable, sincere. That’s the secret. Rather than a nightmare of endless terror, it’s Barnabas’ ultimate dream, complete with kisses from The Josette Character for his evil-smashing bravado. It’s a beautiful moment, and it underlines what 1897 is, measuring his fall with the Leviathans and long struggle to rebuild. Which he does. The only thing missing? Mr. Rorke and Tattoo greeting Barnabas as he departs from a seaplane next to Scatman Crothers, Steve Lawrence, and Marion Ross, and explaining for the audience the fantasy he and the island staff are about to fulfill. Come to think of it, it may be my fantasy, too. This episode was broadcast March 25, 1969.